Is anyone else out there using Full Flavour Media and experiencing very slow (150kbs) or no connection at all this morning? Having checked with a friend using Xtra their download is pretty normal this morning so it appears to be FFM that has the problem. I have left messages with FFM but had no response. This happened a week or so back too but I thought it was a one off. Apparently not. I have the same problem this morning. Actually the speed has been unstable for the last two months for me. AKL CBD here. I am generally not happy with Fullflavormendia and inclined to change next year. Oh, that's bad news. I had the same slow connection issue as week ago but the response from FFM was they didn't know of any faults. I am beginning to question my move to FFM. Orcon is looking good with unlimited $99. I had the slow international traffic a week ago, yesterday and today. 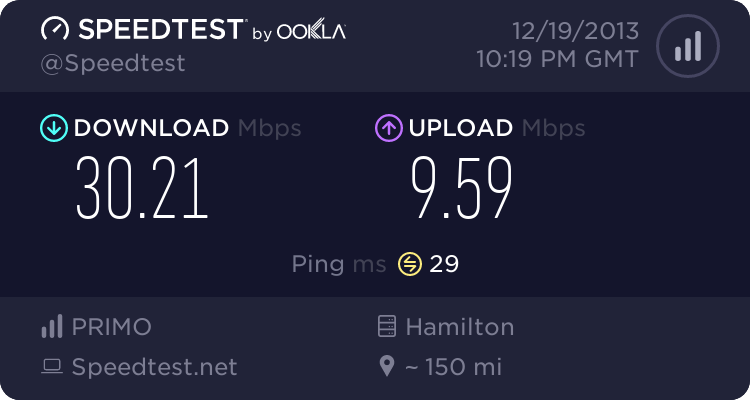 NZ speed test gives me 1.2Mbs, what I expect on our ADSL connection. Normal FFM international speed test to servers on the West Coast of the USA give approx 1Mbs. Speed today (yesterday and a week ago) NZ 1.2Mbs but international is 0.03Mbs. I have a file transfer going on to a US server which normally runs at 1.3Mbs but is currently 150kbs, nearly 1/1oth normal speed. I checked with a neighbour and on Xtra they are getting normal high speed international traffic so the fault is with FFM. No reply on the FFM help line today or answers to my messages. I'm starting to wonder what is up?? As I say, Orcon is look attractive. Will test my connection when I get home have not noticed anything too slow as of late oddly enough I have had to manually set my dns on all my devices or nothing works. Anyone know what the breakage fee is on the 12month term? 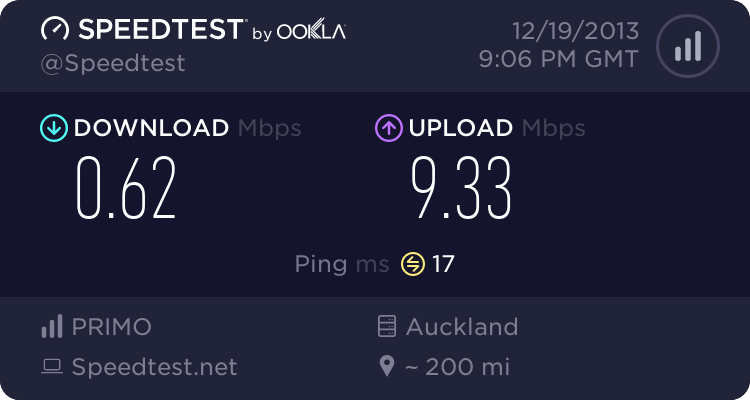 andynz: Is anyone else out there using Full Flavour Media and experiencing very slow (150kbs) or no connection at all this morning? I've opened a support ticket on your behalf, happy to check this out for you. obworld: I have the same problem this morning. Actually the speed has been unstable for the last two months for me. AKL CBD here. I am generally not happy with Fullflavormendia and inclined to change next year. I've sent you a PM, I need your username with us. So how come no reply to calls today and messages left. I sent an email to Jessie about the problems and all I have had in return today is a an invoice and still no proper international bandwidth. How come you can generate invoices but not supply bandwidth? Where are you guys?? Must be 12 calls I have made today. I think the problem is more than a simple support ticket for me. It's effecting other people too. andynz: So how come no reply to calls today and messages left. I sent an email to Jessie about the problems and all I have had in return today is a an invoice and still no proper international bandwidth. How come you can generate invoices but not supply bandwidth? We've been here all day! Haven't seen any support tickets raised by you come through - I've asked for some things via email and I'll follow up with a call shortly. When I ring your number and press 2 for support it rings for 20-30 secs then says you are not available and puts me through to messaging. We'd prefer you to leave a voice message than sit in a queue if there are other calls ahead of yours. I'm working on your ticket now. Yes left 2 messages on your answering system. One this morning around 10 I am guessing and one after lunch. As of 3;50pm this afternoon speed is back up to normal so what happened at 3:50pm? Someone reset something somewhere. I have not done any resets on my router or systems today since the local traffic was normal speed. I rebooted the modem it went back up to full speed however 5 mins later back down to this. Can you open a support ticket by emailing support@fullflavour.co.nz or calling 07 929 7111 and we can go through the troubleshooting process and find out what's throttling your speed (we don't shape domestic so this is odd).